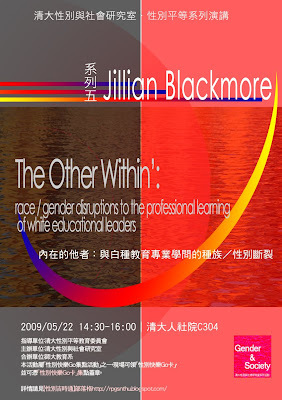 Jillian Blackmore is an Professor at the School of Education, Faculty of Arts and Education, Deakin University. Her research interests focus on Globalisation and localisation in educational restructuring, Educational reform and organisational change, Gender equity reform, Family-school relations and parent involvement, Feminist approaches to leadership and management, and Teachers' and academics' work and the politics of gender and knowledge. Roman (1996) states ‘white is a colour too’. Yet the whiteness of educational leaders is rarely questioned, although masculinism- the enduring capacity of different masculinities to remain the norm in leadership—is increasingly under scrutiny. Rarely do white men or women leaders question their whiteness, whereas indigenous and other minority groups, as a consequence of their being ‘other than white’, are expected to explain their exclusion. Instead, the ‘problem’ is depicted as the lack of ‘the other’, and therefore a problem for and of ‘the other.’ This paper confronts normative whiteness in educational administration from the perspective of feminist and critical race theory, considering how foregrounding whiteness in leadership is a necessary condition of inclusive education and leadership.